Atlantic Media hosted a dinner on Friday, April 30 that we had the chance to collaborate on with our client Susan Gage Caterers. 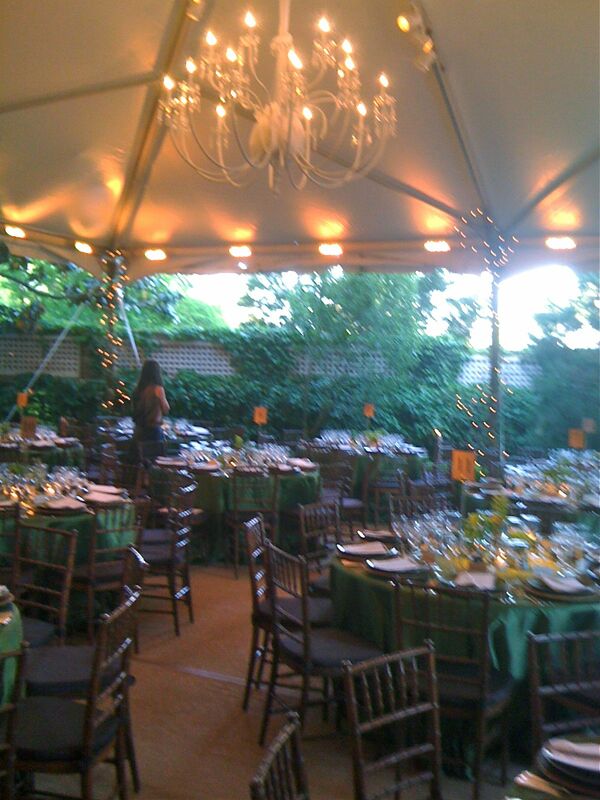 It was great to help create this “green themed” event. From the LED lights surrounding the outdoor tent, to the seed paper menus which highlighted locally sourced foods and biodynamic wines, to the green raffle prize, among many other green attributes – this event demonstrated to us how to integrate green not just in catering operations, but also in creating a green experience for the guests. The Room – The room was lit using LED Lights – LEDs are light emitting diodes, which simply refers to the way light is emitted from the bulb. What are the advantages of LEDs? They consume less energy, have a longer lifetime than incandescent bulbs, and have greater durability and reliability. They do require a greater upfront investment but the energy saved and longer lifetime result in a total savings. Many cities in the US are replacing their incandescent traffic lights with LED arrays because the electricity costs can be reduced by 80% or more. 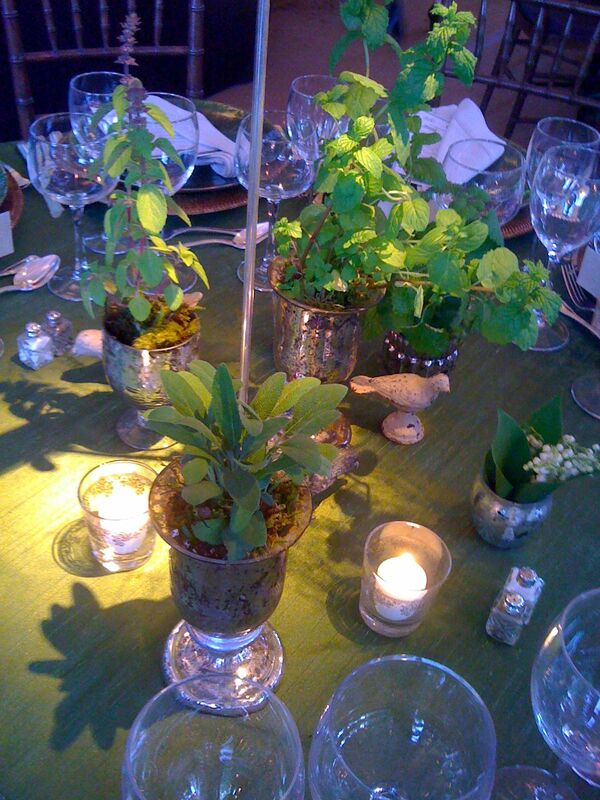 Centerpieces – the arrangements in the center of the tables contained herbs from a local farm in Burtonsville, Maryland. Leftover centerpieces were donated to two newly started school garden projects in the DC Northeast areas. The first is DC Prep’s elementary school campus off of Benning Road. Right now this school is pre-school through 2nd grade and for a year the students had nothing but an asphalt parking lot to play in. Now, they have a completely revamped playground and a huge school garden that they just planted in mid April. The children planted sunflowers they had grown from seed in the window sills and parents and teachers helped them plant the first watermelon, squash and other veggies. These herbs will be part of a perennial herb garden that will brighten the garden and keep the maintenance low for all the teachers. The rest of the herbs went to a joint collaboration along the new Metropolitan Branch Trail that connects Edgewood and the New York Avenue metro station with Union Station. DC Prep’s middle school and Beacon House, a local community center, will be starting a summer program where the students will be building edible forest gardens. The students will be planting a small orchard of 10 fruit trees, berry bushes, herbs, perennial onions, purple tree collard greens and other perennial vegetables. The program will then plant (4) 60 foot rows of veggies for the students to take home to their families. Linens – All of the linens were provided by Susan Gage Caterers, which custom makes their own linens and after every event returns them to their warehouse for cleaning in eco-friendly detergent and storage for reuse at future events. Placecards – Ellie Pooh paper in cork holders. 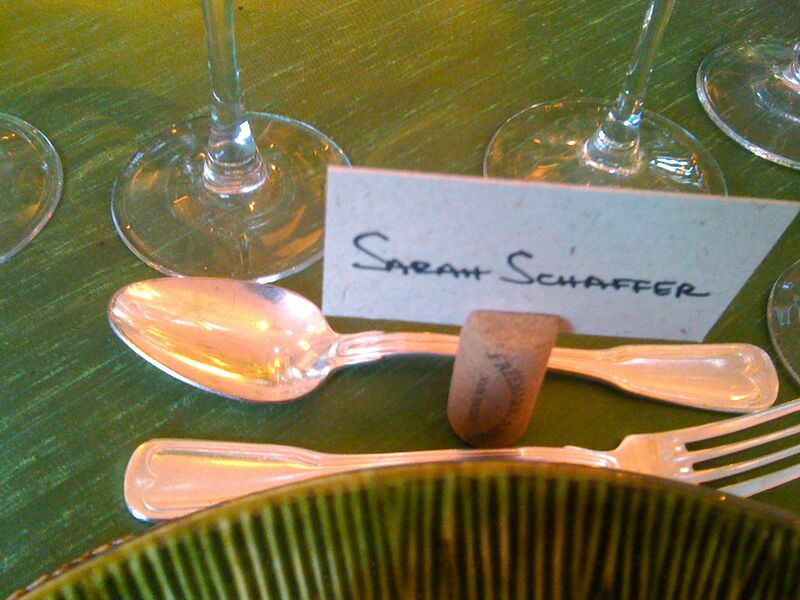 The placecards are 100% handcrafted, 100% recycled, and 75% elephant dung. What? Yes – elephant dung. Why? One day a man named Karl decided he want to make a difference by helping people around the globe take care of the environment. He ended up in Sri Lanka. In Sri Lanka they kill elephants because they interfere with the agriculture. So Karl had an idea – create value from the elephants by creating paper from their dung. Learn more about his story here. Cork placecard holders – cork is rapidly renewable resource that is now also being used for flooring. Cork is actually the bark that is scraped off the Cork Oak tree, native to the Mediterranean basin. The tree is not harmed by the removal of the outer layer of bark and the layer renews for harvesting every nine years. In addition, most of the cork that is used in flooring is the waste from the cork wine bottle stopper industry, so this fast growing material is also recycled from use by another industry when it goes into flooring. Cork’s specialized cell structure – honeycomb hexagonal cells comprised of 90% gas – gives the material its light weight and low density. These properties make cork flooring soft and resilient underfoot and dampen sound while providing insulation. 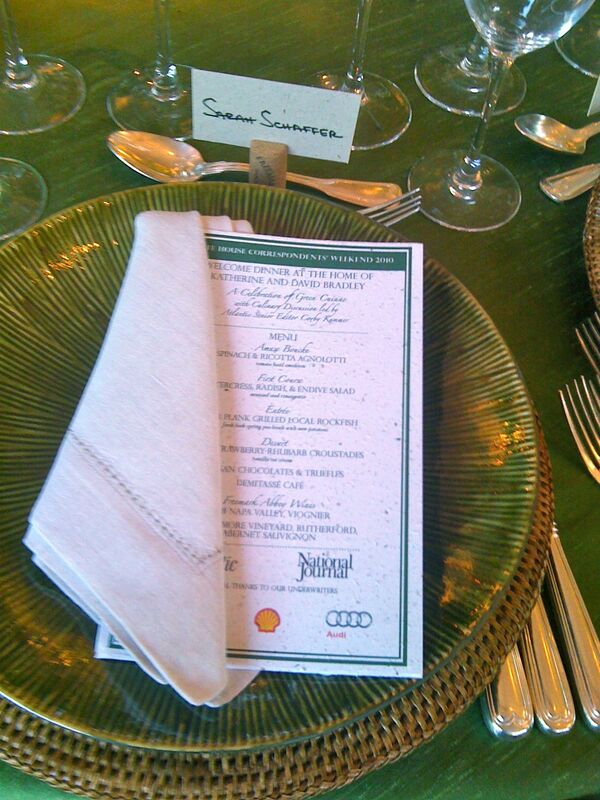 Menu Paper – The menu was printed on seed paper that guests could take home and plant. It’s made of 100% post-consumer waste paper and contains wildflower seeds. They were printed by Botanical Paperworks. Radish Chive tea Sandwiches. Tuscarora Organic Growers (Hustontown, Pennsylvania). Mint from North Carolina. Why Go with Local Food? Eco-Facts: Food, on average, travels between 1,500 and 2,500 miles from its point of origin to it point of consumption. It takes a lot of energy to refrigerate and transport food. Buying form local farmers supports family farmers rather than large-scale agribusiness, requires less packaging, and usually guarantees fresher, more nutritious food selection than those coming from long-distances because fewer to no pesticides and preservatives are needed.